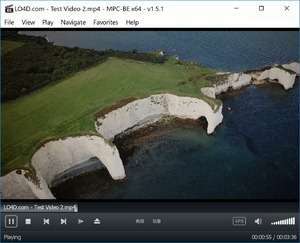 MPC-BE (Media Player Classic - Black Edition) is a free and well thought-out video player which has taken a lot from other open source projects, especially that of the original Media Player Classic. Since the program uses the code of the ever-so-successful MPC, it is fully capable of playing almost any known video file format currently available and it is also highly capable of playing back audio files without any hitches. MPC-BE can play Blu-ray dics, DVD discs and other optical or solid state media. The user interface of MPC-BE is very easy to use and includes all of the main basic controls of other media players (such as play, stop, pause, etc. Version 1.5.3.4488 is a freeware program which does not have restrictions and it's free so it doesn't cost anything. For security reasons, you should also check out the MPC-BE download at LO4D.com which includes virus and malware tests. Additional screenshots of this application download may be available, too. MPC BE download been highly rated by our users.